Perfect strokes helped the super seven girls aged eight and under to record personal backstroke bests at Aqualibrium. 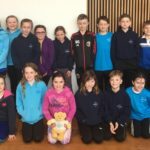 They joined 29 other swimmers, ranging in age from six to 16 years, at Kintyre Amateur Swimming Club’s annual championships last Saturday. The afternoon’s competition started with both the 100m and 200m individual medley events. Competitors combine all four swimming strokes in the one event. Caitlin Russell, 13, took the girls 13 and over event in a new PB of 2:53.78. Twelve girls swam in the nine to 10 years 50m backstroke with Rianne Coffield touching first in 48.41. Over 100m William McLean took almost four seconds off his PB, finishing first in 1:38.04. Iona Renton destroyed her previous time over 100m taking more than 10 seconds off to finish in 1:27.16 and take gold. Seven-year-old Angus Woods, competing in his first championships, swam an excellent length of breaststroke breaking 30 seconds and finished first in 29.92. This was followed by an outstanding swim by Ruaridh Campbell, in the boys 100m breaststroke, where he knocked more than 10 seconds off his PB to touch first in 1:47.63 just in front of Jamie Colville. Caitlin Russell continued her fine form improving her 100m breaststroke time to 1:34.17. In the butterfly, 16-year-old, Ryan McGeachy recorded a narrow PB of 1:16.20 followed by Josh Horan who touched in second knocking more than seven seconds off his existing PB. 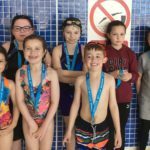 In the freestyle events Jamie Colville, 12, smashed his existing PB by 20 seconds to finish first in 1:22.25 and there was a closely contested swim between 13- year-olds Caitlin Russell and Astrid MacLellan. Both girls swam personal bests of 1:11 with Caitlin just touching before Astrid in 1:11.04. In the final event of the afternoon’s competition, the open 200m freestyle both Caitlin Russell and Ryan McGeachy took the titles with excellent swims over eight lengths. 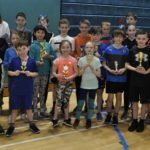 After the points were tallied up the 2017 club championship trophies were awarded to the following swimmers: Girls eight and under: Ailie Renton; boys eight and under: Angus Woods; girls nine to 10: Violet Campbell; boys nine to 10: Max Graham; girls 11 to 12: Iona Renton; boys 11 to 12: Jamie Colville; girls 13 to 14: Caitlin Russell; boys 15 and over: Ryan McGeachy. Gregor Campbell’s starting dive. 25_c46Kasc03_Gregor_Campbell_starting.